In a previous post, I discussed divergent thinking, an important part of innovation that’s not adequately supported in many workplaces. I also described how group dynamics can influence divergent thinking. In this post, I’ll take a look at some strategies and tools that can be used to promote divergent thinking. Divergent thinking is more likely to thrive in an environment that allows for different types of expression, encourages risk, and allows failure. As trainers, we can support divergent thinking by facilitating and supporting individual expression. We also play a role as community leaders, nurturing group environments so that many different voices are heard and respected (see also Social Learning and Radical Innovation). There are many different techniques that encourage divergent thinking. Although I’ll discuss these techniques as opportunities for social learning and collaboration, these also can be used as solo activities. This is probably the technique we are most familiar with. During brainstorming, participants spontaneously contribute ideas in response to a problem statement. Crafting a good problem statement requires some skill. You don’t want the problem to be so broad that it will be difficult to find patterns in ideas and possible solutions. You also don’t want it to be so specific that the solutions seem relatively inevitable. You’ll also want to consider the size and mix of people in your brainstorming group. Keep the number of individuals in a brainstorming group fairly small (e.g., 5-12 people) so that no one feels lost in the crowd. Additionally, gather group members who will naturally have different perspectives, e.g., researchers, product development people, sales people/customer-facing people, business development people, and yes, even, your patent attorneys. There are many techniques you can explore to make brainstorming more interesting. SCAMPER is one of them. More brainstorming games and exercises are described here. Exploratree provides some additional tools and templates for supporting metacognitive processes. Here, groups of people who are brainstorming don’t have to speak to each other, at least initially. Ideas are written down (e.g., on sticky notes or index cards) and shared later. This encourages all voices to be heard and prevents people from forgetting their ideas as they wait for an opportunity to speak. Building on ideas occurs after ideas are shared. In a variation of this technique, one participant writes down three ideas on a piece of paper in response to a problem statement and passes it on to the next participant who writes down three different ideas and then passes it on to the next participant who continues the process. 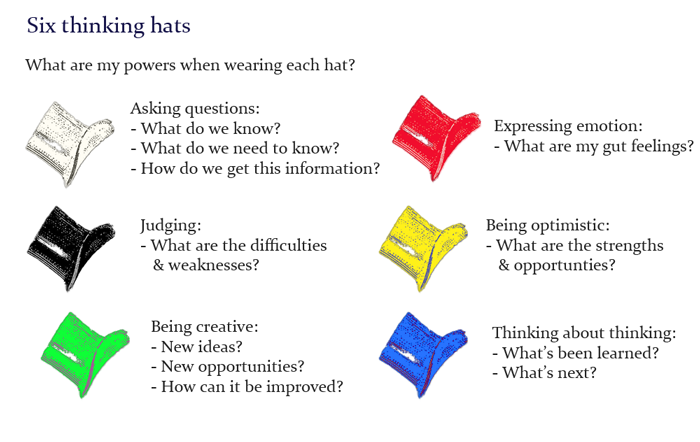 Pioneered by Edward de Bono, the Six Thinking® Hats system encourages parallel thinking— viewing a problem from different perspectives depending on which “hat” you’re wearing (de Bono, 1985), as illustrated below. The crux of lateral thinking is to attempt to solve problems by unorthodox or apparently illogical methods. In his book, Serious Creativity (1992), de Bono describes some lateral thinking techniques for spurring creativity. Concept fans: Representing a problem as a central circle, write down possible solutions as a series of lines radiating outward from the circle. If the solutions aren’t quite what you want, try reframing the idea. Draw it as a second circle connected to the first circle and write down possible solutions for the new problem. Keep repeating the process, reframing problem statements and fanning out ideas. Then change the parameters of the idea, e.g., “We should make formal training less than 5% of our training efforts,” and begin the process again, repeating until you reach results that are optimal for your organization. Random input: Choose a random object (e.g., a noun from a dictionary or an object in your office or another environment) and associate it with a problem you’re thinking about. What are the connections? How can these connections be used to solve or expand upon the problem? As an example, if the problem is how to optimize informal learning in the workplace, some objects you might consider are playgrounds, campsites, crockpots, scavenger hunts, etc. Your challenge is then to consider what attributes of these objects could be used to solve the problem. Challenge ideas: This involves asking why something is done the way it’s currently done. You can challenge problems, solutions, or anything in between. The idea is that when you challenge something, you start thinking of alternatives. Disproving: Take the crowdsourced view of things and challenge it. See if you can support your own different position. Technology offers some exciting ways to complement and enhance divergent thinking techniques. With the advent of collaborative web-based technologies, groups can be geographically dispersed and ideas can be collected in real-time (or a close approximation), asynchronously, or by using some combination of these approaches. And don’t forget that you can use social networking platforms like Miio and Twitter for some basic brainstorming. Use hashtags on Twitter for public brainstorming. Miio allows you more room to add text, multimedia, and threaded conversations, and an important plus, provides the option to create private groups. de Bono, E. (1992). Serious Creativity: Using the Power of Lateral Thinking to Create New Ideas. London: Harper Collins Publisher, Ltd.